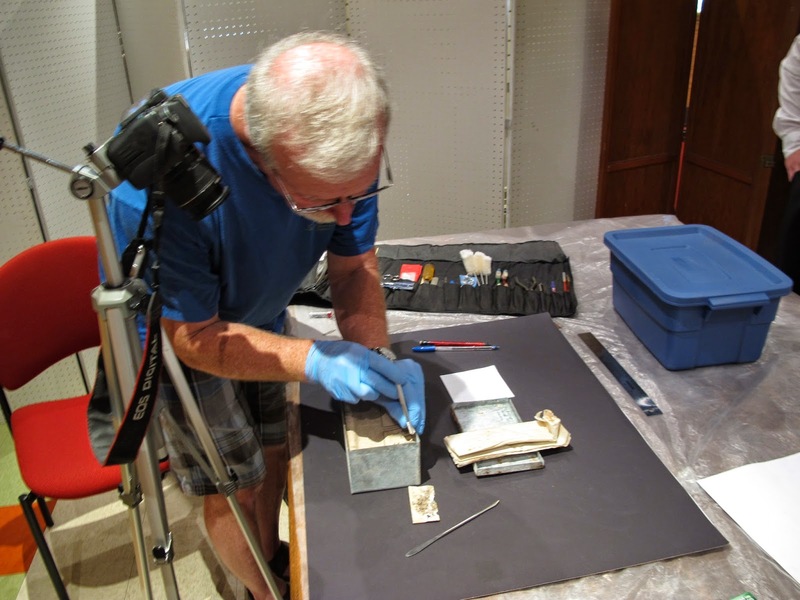 Documenting conservation work on objects in community museums in Nova Scotia CANADA. The capsule reacted strongly to a magnet implying that it has high iron content. The exterior and interior does show patches of reddish coloured corrosion which is another clue to iron content. The lid was made of a single flat piece of metal with notches in the four corners and folded over to produce an edge. One of the consequences of this is that there are minute openings in each corner which could allow moisture to enter the capsule. Moisture was evident on opening day on the paper observed. The first thing I noticed upon opening the lid was that the handwritten sheets of paper folded on the top were now loose from the sides of the capsule. It is likely that it dried out to the point where it came loose. However, the newspaper below it was still attached to the sides. The folded up, handwritten pages came out easily with no tearing. On the other side a small business card in very bad shape was attached to the paper but came loose very easily. It is not easily readable but does have two lines printed in the lower left corner: Dominion Atlantic Railway and Engineer and Mechanical Supervisor. The person's name in larger lettering is printed in the middle. All is obscured by black spots and general deterioration. It is very fragile and requires special handling. Below this was a folded up newspaper with some parts attached to the sides of the capsule. I used an exacto-knife with a larger, flat blade to scrape along the sides to loosen the attached bits. This was done all around the sides. The newspaper came loose after a few minutes with minimal damage. This newspaper was dated April 18, 1929, two months before the capsule was placed. Beneath this was another newspaper. I was able to loosen the newspaper using the exacto-knife. It was dated June 19, 1929. The date the capsule was placed. What is in the bottom? Below this was a third newspaper and unlike the others this one had attached itself to some parts of the capsule beneath it causing slightly more tearing. This could not be loosened via an exacto-knife due to the location. However, it came out with only minimal damage. 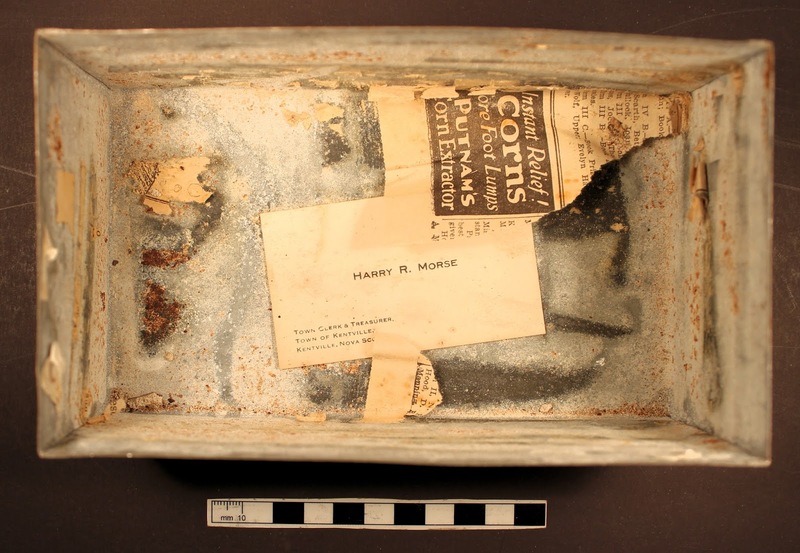 Some bits of newspaper are left intact in the bottom of the capsule along with a very well preserved business card for a Mr. Henry Morse Kentville Town Clerk and Treasurer. Although some small pieces of the newspapers were torn on removal all the text is readable except for the pieces shown at the bottom which will be left as is. In my next blog entry I will show details of the handwritten pages. It is currently being transcribed by one of our museum volunteers. I will also write about the inscription on the inside corner of the lid. There are a few techniques that can be used with the right equipment to make the inscription clearer. document my activities at the Kings County Museum in Kentville, Nova Scotia CANADA. Conservation Tips. This section in some of the posts will provide specific tips on preventive care and conservation treatment. I will be cleaning, stabilizing, and treating objects but also, designing proper storage and preparing exhibits. I hope to provide tips on all of these subjects. Comments are welcome. Comment by clicking on "No comments" shown in red at the bottom of each post. This also shows as "1 Comment" if there was already a comment. You will be presented with the option to comment and pick a profile such as Anonymous or Google+. Anonymous allows you to comment without registering whereas the other options require you to register first or use an existing account such as Google+ but, in all cases for security reasons I will take a look at them before publishing. While I hope you find the information in this BLOG and the information provided by those organizations I have listed in Links To Related Websites of use and interest, I expect people to recognize that any work done on an object is a risk and is best performed by trained professionals. I cannot be responsible for any damage done to items due to information provided herein. There are individuals and organizations you can contact as follows if you need assistance. You can contact the Museum of Natural History at their general information number 1-(902) 424-7353 in Halifax, Nova Scotia if you have questions about an historical artifact or need advice or assistance with artifact conservation. 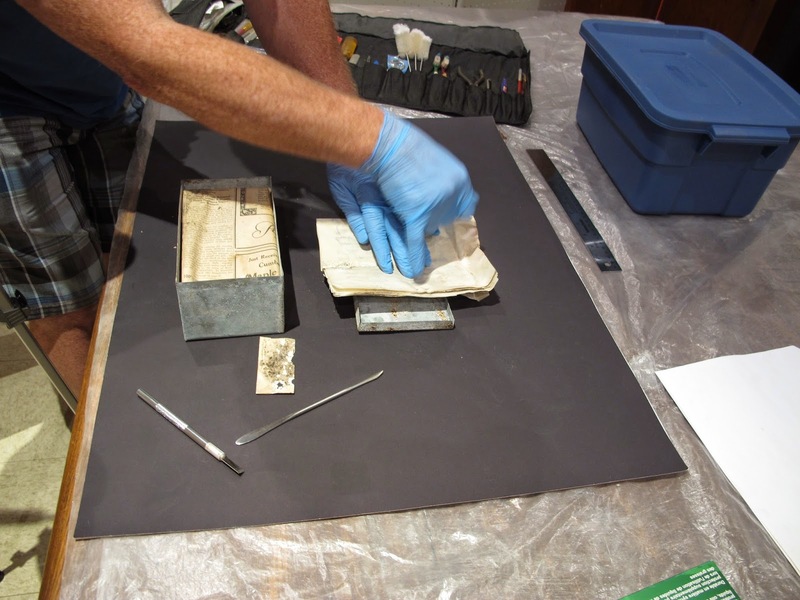 Canadian Association of Professional Conservators - CAPC is the national accrediting body for conservators. They have a listing of members both geographically and by speciality.